If you take a photograph in a public place, and then publish it commercially, can the people in the photo successfully sue? See the answer (or lack thereof) here. If you ask the guards at the NGA which painting in the collection they think is the most popular, often you will hear many of them point out Dali's The Sacrament of the Last Supper. "People are always asking 'where is it?'" The reason for this could be that the Last Supper, in a typical act of perhaps arrogance, for many years was hung in the NGA's coat check room, and currently is at the exit of the old wing, just before the connecting tunnel to the newer East wing. I say arrogance because I once asked a guard (often the best sources of info in any museum) the reason for the placement. "This wing is for masters," he said, "and this Dali painting was donated to the NGA as part of the Dale Bequest in the 1960s, but with the condition that it had to be placed with the old masters." The NGA complied, but couldn't or wouldn't cross the line and instead of hanging the Dali in one of the galleries, for years hung it in the coat room, where it attracted too many crowds and made that room a mess, and subsequently moved it to its present location, technically in the West building, but not really "in it." A few years ago I asked the NGA for confirmation of this story, but my request was never answered. 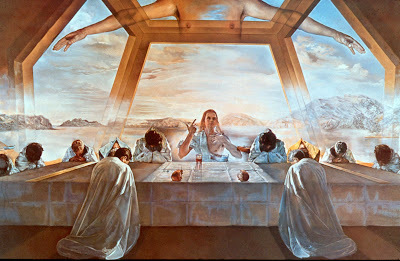 But this post is not about Dali or the NGA, but about most "Last Supper" paintings that I recall seeing. More specifically about the bread in the paintings. This week I was invited to a Seder meal by a friend who is also quite a well-known Philly area artist and an even better known curator. Somehow the conversation turned to Christ's Last Supper, which of course was a Seder meal and she observed how most paintings depicting The Christ's last meal showed regular bread instead of the unleavened bread required by Jewish tradition to celebrate the passover. This is very interesting to the pedantic part of me, already troubled by the fact that nearly every depiction of The Christ that was presented to me in art school depicted mostly Northern European-looking Christs, rather than the Semitic Middle East Israelite that He was. And now I wonder, are there any contemporary depictions (or any depiction) of the last supper which depict this last Seder for Christ in a more historically correct perspective? I want to see The Christ as a Semite and I want to see the middle of the matzot on the Seder plate broken in two with the larger piece hidden, to be used later as the afikoman.